A museum displaying skeletons of sea mammals may not sound like it offers kids a whole whale of a time, but the Canarian Cetacean Museum - also based in Puerto Calero - is an ultra modern, interactive facility which provides a fascinating insight into the lives of the dolphins, whales and porpoises that live in the waters around Lanzarote. Cetaceans are large marine mammals and the museum is the result of more than 20 years of research into these species. Visitors see life-sized replicas and skeletons of the fascinating creatures, as well as animated displays that really bring the subject matter to life. A trip on board the Blue Delfín offers the opportunity to meet these mammals in the flesh. This giant catamaran operates out of the harbour in the Old Town of Puerto del Carmen, Lanzarote's largest holiday resort, and offers tours along the island's coastline and trips across to neighbouring Fuerteventura. Seeing dolphins and whales is not guaranteed - these creatures can prove elusive - but plenty of sightings are reported as they often appear in order to play in the wake created by the craft. The Gran Karting race track offers four-wheeled fun for budding Lewis Hamiltons of all ages. It's a professionally designed course that delivers plenty of thrills without any of the spills. Under-fives can ride small battery-driven karts or double up with their parents at the controls. Five- to 12- year-olds compete in the Infantil class on a 110-yard track, driving karts with restricted speeds under close supervision. Older children, from 12 to 16, race against each other on a longer course, again under close supervision and wearing safety gear. The course is flat and surfaced with a high quality asphalt providing excellent adhesion. There are also mini bikes available for boy (or girl) racers who prefer two wheels to four. Free transport to and from the track is available to groups of six or more people. outskirts of Puerto del Carmen. It offers a whole wagonload of activity, from wigwams and stage coach rides through to injuns on horseback and the chance to prospect for gold. 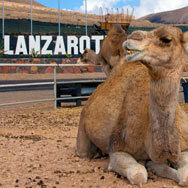 It's also the largest zoo on Lanzarote - giving youngsters a chance to meet an impressive array of animals, from the small and cuddly creatures in Lilliput Farm, such as the miniature ponies, through to bigger and wilder species such as buffalo, antelope, puma and even some rare white tigers. Displays, staged throughout the day, feature parrots, crocodiles, sea lions and birds of prey. Go wild at Guinate Tropical Park, which has 1,300 exotic bird and animal species, including flamingoes, ostriches toucans, parrots, macaws, monkeys, lemurs and meerkats. The latest star attractions at Guinate are the recently arrived Humboldt Penguins - a rare and endangered species indigenous to Peru and Chile. Younger visitors will also be delighted by the parrot shows staged throughout the day featuring bike riding macaws, high wire walking parrots and lots of other amusing avian antics. Lanzarote A Caballo is an equestrian and camel riding centre handily located just outside Puerto del Carmen and providing plenty of action and adventure for kids. As well as horses, the centre has Shetland ponies, emus, camel-drawn wagon rides, plus dromedary and pony trekking and horseback riding for teenagers - all under the supervision of expert instructors.